I’m speaking of the old Citrix Receiver client. You launch that and that puts you in a Citrix ICA “jail.” I recently help a company move an app which had been a browser-based app to a browser within Citrix. Users complained they could not print from it… All their local printers were gone. Only a Citrix Universal Printer can be chosen. 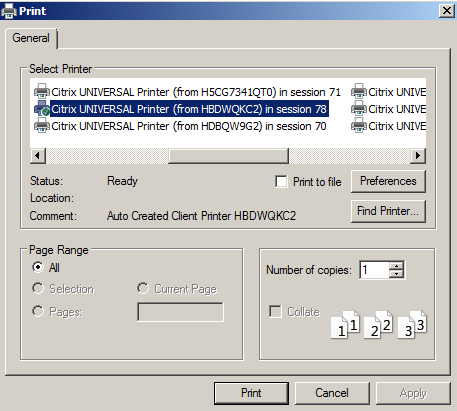 When you print, choose the Citrix universal printer. Click on print again. You get a print preview screen. Click on print again and the print job will be sent to the desired printer. Simple enough, unless you’re going through it for the first time! How did Citrix Receiver client break out of the jail? I am told that it uses EMF format. That’s Enhanced Metafile, a successor to WMF, Windows metafile. 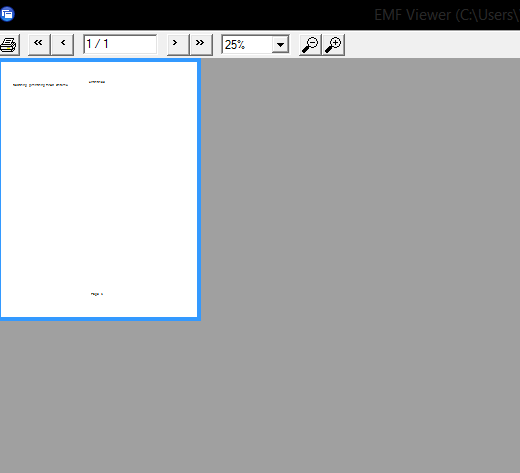 EMF is a graphics language used in printer drivers. The Wikipedia article on this is surprisingly brief and skeletal: https://en.wikipedia.org/wiki/Windows_Metafile#Variants. So I guess it’s not really a jail at all – that was just my term. And the details beyond this unsatisfactory explanation I do not know. I’ll keep it on the back burner in case I ever get an opportunity to learn more about it. I sometimes write blog posts as a sort of high-quality journal entry. I may very well be the only person who ever refers to them, and that’s OK. It contains enough information to prod my memory though it may not be polished enough to help many others. This entry was posted in Web Site Technologies and tagged Citrix Receiver, ICA. Bookmark the permalink.